Sen. Chuck Schumer (D-NY) on Monday joined the chorus of calls for Gov. Ralph Northam (D-VA) to resign over a racist photo in his 1984 medical yearbook. “I agree. It’s past time,” Schumer tweeted in response to a joint statement by Sens. 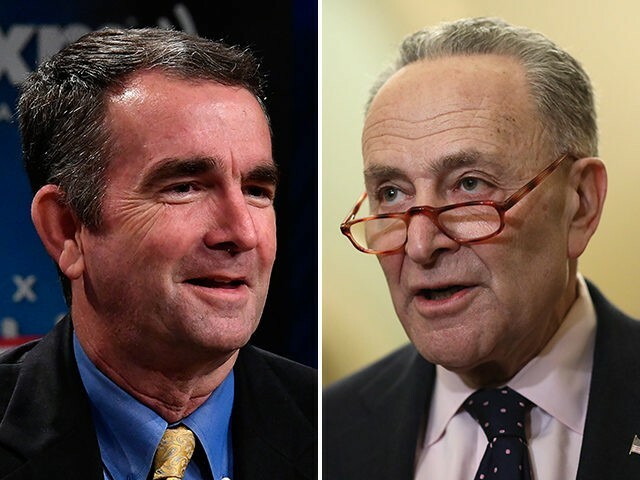 Mark Warner (D-VA), Tim Kaine (D-VA), and Rep. Bobby’s Scott’s (D-VA) call for the embattled governior to step aside. “Governor Northam should resign so Virginia can move forward,” said the Senate Minority Leader. The trio of leading Virginia Democrats urged Northan to resign after he delivered a bizarre press conference Saturday in which he backtracked on his admission that he appeared in the 1984 Eastern Virginia Medical School yearbook with another male in blackface or Ku Klux Klan garb. During the presser, Northam admitted to wearing blackface as part of a Michael Jackson costume for a dance contest the same year and was ordered by his wife not to moonwalk — a dance move made popular by the music legend — when asked if he could still perform it. According to the Washington Post, a former classmate of Northam tipped off Big League Politics about the photo, which was first to report on its existence Friday. Hours later, the Virginian-Pilot and the Post verified the photo’s authenticity. It is believed the tip came in response to the Virginia Democrat’s remarks about proposed legislation that would have allowed fourth-trimester abortions. “A concerned citizen, not a political opponent, came to us and pointed this out. I was very offended [by the photo] because I don’t like racism,” Patrick Howley, who serves as Big League Politics’ editor-in-chief, told the Post. As of Monday afternoon, reports indict Northam has no immediate plans to resign.